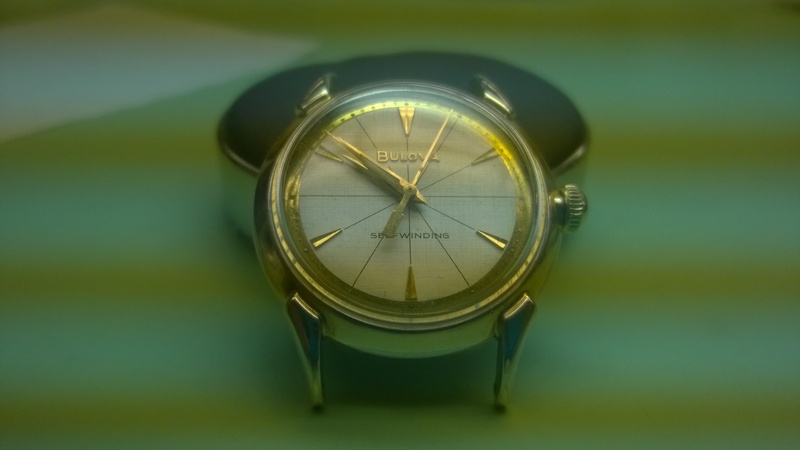 My introduction to Automatic Watches started with a Bulova 11 AFAC. It’s a pretty simple watch (time only) and has a movement architecture similar to other Bulova’s that I have worked on. I really liked this watch. I have to say, going through the program at TIJT has really helped me to expand my appreciation for vintage watches. For a long time, I would look at posts on forums or read articles where collectors were foaming at the mouths over vintage pieces and I didn’t get it-to some extent, I now understand. Except when it comes to an overuse of the word “patina.” I’ve seen some pictures of some horribly beat up watches that would look amazing with a refreshed dial, but for whatever reason, patina is king with some collectors. With that aside being said, I want to talk a little about my experience with automatics. Because my teacher has a pretty decent stock of watches, I was exposed to quite a few types of automatic (and to a lesser extent, calendars) movements. The differences could be anywhere from how the rotor/oscillating weight was secured to the movement, to what kind of gear-train made up the automatic mechanism, and one in particular (I’ll get to it soon) was so ridiculously simply in its design that I wonder why it hasn’t been copied and adopted by everyone (I’m sure as I progress further in my studies and eventually get into the “real world” I will figure out the answer to that question). Having said all that, an automatic mechanical watch is simply a watch that is able to transfer kinetic energy of your arm moving through a train of wheels to wind the mainspring. There are some other, smaller differences that I will touch on throughout this entry and others. Look at that awesome rotor. I don’t know why, but images of Superman went through my head when I first looked at this movement. 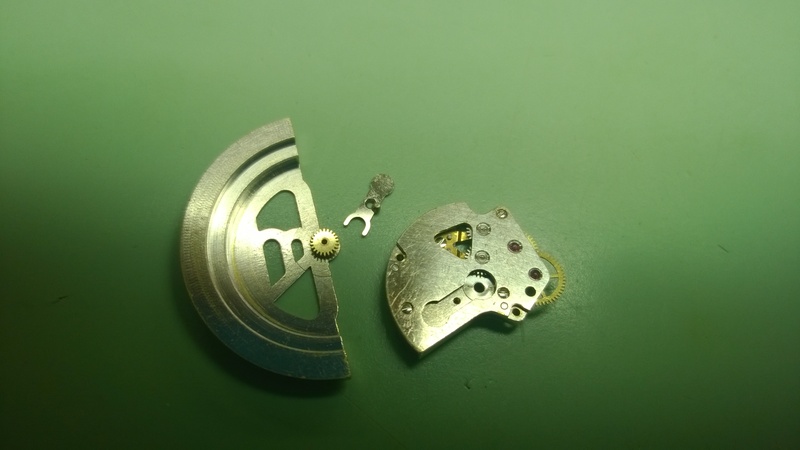 Once I got the movement out of the case, I had to remove the rotor and the bridge before I could start working on the movement. Unfortunately, I don’t have a better picture than the one above (well, one that isn’t dismantled), but if the rotor was rotated 180°, you would see a small clip/plate that holds the rotor in place. Once you remove the rotor, you can remove the automatic bridge. When you take down the automatic mechanism, you will find a series of wheels, gears, pinions, etc that all work in harmony to wind the mainspring. On this watch, the rotor moves 360° and winds in both directions. In the next few pictures, I’ll show you how that works. In the above picture, you have the rotor separated from the automatic bridge along with the clip that attaches the rotor to the bridge. The rotor has a gear (oscillating weight gear) that fits in the center space on the auto bridge. The first alternating gear meshes with the second alternating gear and causes it to slip/disengage from the second alternating clutch. When the alternating gear/clutch turn counter-clockwise, they turn an intermediate winding wheel clockwise. This engages a third winding wheel in a counter-clockwise direction which finally turns the ratchet wheel in clockwise direction (and, as a refresher, the ratchet wheel is on top of the barrel arbor and winds the mainspring as it (the ratchet wheel) turns). What happens when the rotor turns counter-clockwise? Almost the exact same thing. The rotor gear turns counter-clockwise, the first alternating gear now turns clockwise (and disengages from the first alternating clutch), the second alternating gear turns counter-clockwise and engages the second alternating clutch and engages/affects the rest of the wheels in same manner as before. 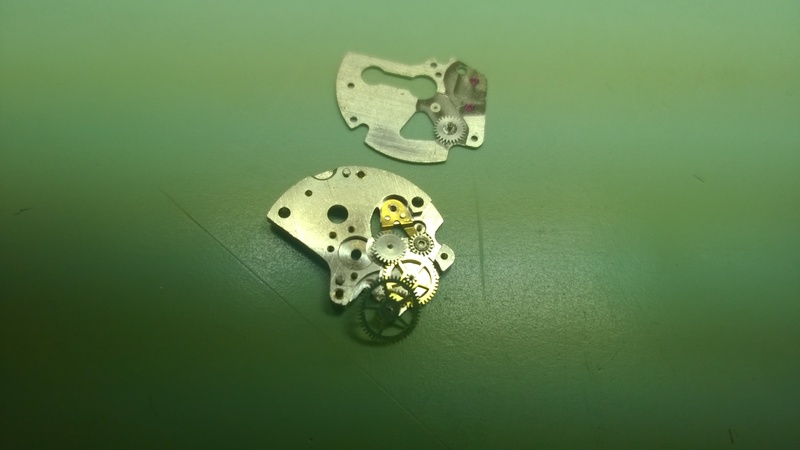 The end result is either way you turn the rotor, the mainspring will wind. Past that, there really isn’t much to say about this watch. 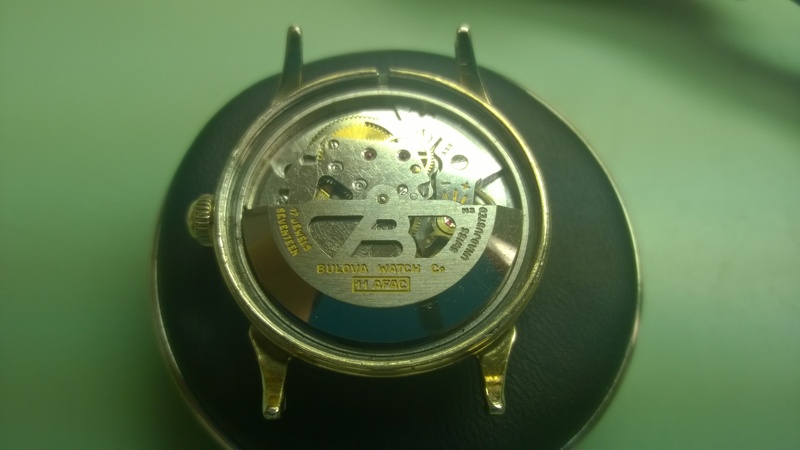 It’s a Bulova, and like another Bulova I worked on, it has a wheel-over-wheel set-up to drive the seconds hand-pinion that is held in place by a tensioning spring. The barrel was not able to be opened. When ordering spares, you had to order a barrel complete instead of a new arbor, mainspring, cap etc. I’m not too sure what the reasoning is behind this, other than perhaps a manufacturer specific lubricant being used? Also pay attention to the ratchet wheel. Someone lovingly carved their initials into it. 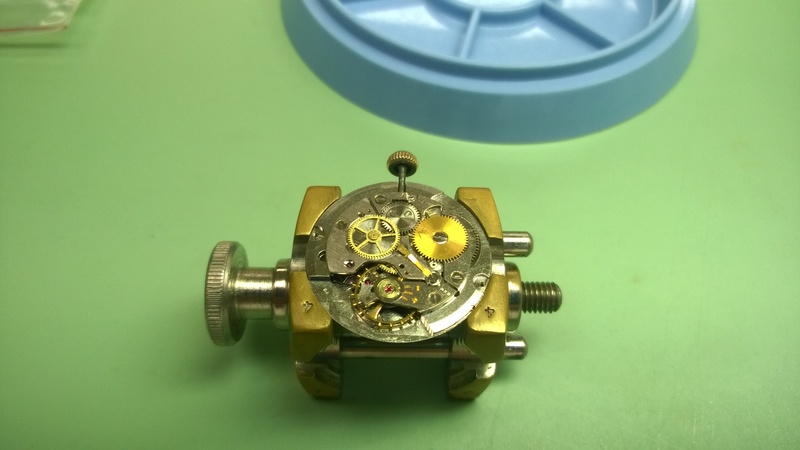 This used to be a semi-common practice way back in the day of watchmaking. 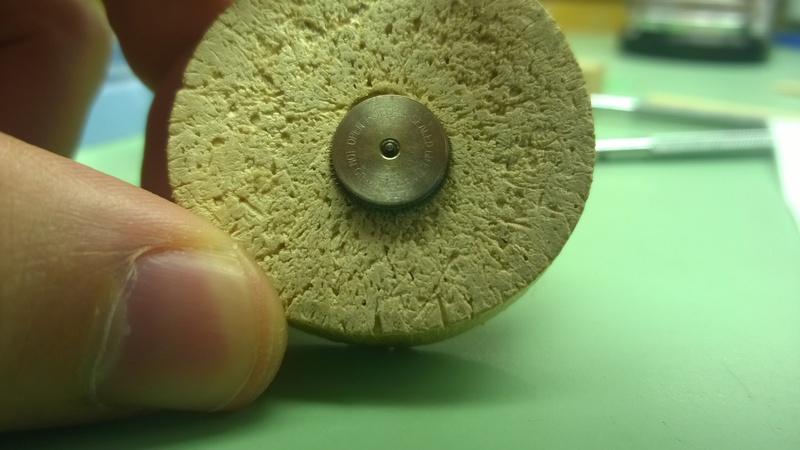 Watchmakers would scratch job dates, their initials or even job codes in casebacks, on parts etc. Now, some people will use a marker/pen which I still think is a bad idea, but hopefully those habits are dying out. All in all, for my first automatic watch experience, I had a good time learning on this one. Thanks for this post. I have a few in a drawer waiting for attention. Awesome! If you you end up working on them, let me know how that goes! Be careful removing the wheel-over-wheel; it’s very easy to bend the pivot or the wheel itself. I don’t know the tool number, but Bergeon made (maybe still does) a tool that was designed to remove wheel-over-wheels. You can also make two collet wedge tools to do the same thing.